(Spanish Only) Sólo en español. SERIES CURRICULARES PARA ACORDEÓN DIATÓNICO • Nivel 2 • 61 vídeos • Profesor: Antonio Tanguma, jr. The videos in this course are in SPANISH only. Español: Haga clic aquí para este curso de acordeón diatónico en español. How to Learn the Diatonic Accordion with Antonio Tanguma Jr. 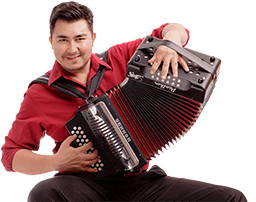 Your Accordion Teacher: Antonio Tanguma Jr.
Accordion Life has partnered with Antonio Tanguma, Jr. to bring you a curriculum for learning to play and enjoy your Diatonic Accordion with a variety of popular songs. Antonio is a graduate of Universidad Autónoma de Nuevo León, UANL, one of the best universities in Mexico and Latin America. He has a B.A. degree in Music and Instrumental and currently working on his Masters degree in Psychology. Antonio is an accordionist, singer, composer and arranger. In 2012 he represented Mexico and placed 5th in the World Championships for Accordion — Trophée Mondial del’ Accordéon. The Core Curriculum Series is for people who want a structured method course. This starts with the Preliminary Basics, Level 1, Level 2, etc. Each course is packed with songs that are focused on learning needed objectives and proper technique. The Single Song Tutorials are courses that feature one song corresponding to the same grade levels that are used in the Core Curriculum Series. 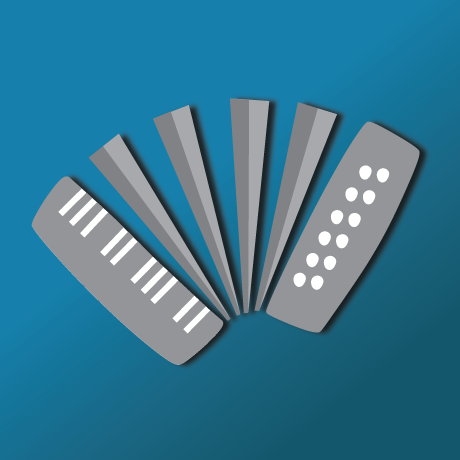 These Single Song Tutorials courses focus on showing you “what” to play, demonstrating hands separately and together using high definition cameras, which allow you to see what to do close-up in ultimate detail – so you don’t miss a thing whether you watch this on your computer, smartphone, or your favorite tablet.